Céüse 2017: N.Wales to French alps in an Electric Car! I'm writing this post on a rest day while on a climbing trip in Céüse in the French alps having driven here from North Wales in our Nissan LEAF electric car (EV) fully loaded with 4 people plus camping and climbing gear. As always climbing and hanging out at Céüse was very pleasurable, it's one of my favourite places. On the news today there has been much talk about EV's as the government has announced a ban on petrol and diesel cars by 2040. This is great news. Although I expect no one will want to drive a petrol car long before then after experiencing an EV. The government announcement today has sparked lots of concern from non EV drivers that it's not possible to travel long distance in an EV. I hope this trip will demonstrate otherwise, albeit with a bit of planning. 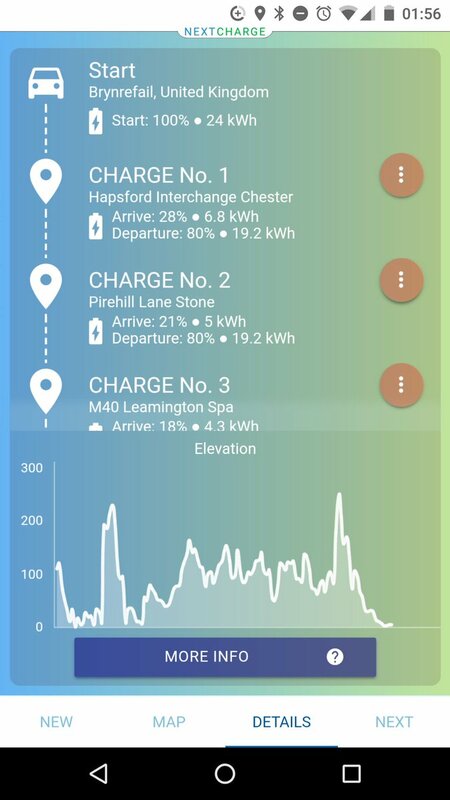 We drove a 2nd hand 2014 Nissan LEAF with a 24kWh battery, all new EV's have significantly larger (30-40kWh+) battery, therefore can travel further per charge making long journeys like this even easier. When I started driving an EV at the end of last year the plan was to 'electrify' and reduce the carbon emissions for our daily commutes to work and local driving around N.Wales e.g. cragging on the Orme, Pass, Tremadog, Gogarth etc. 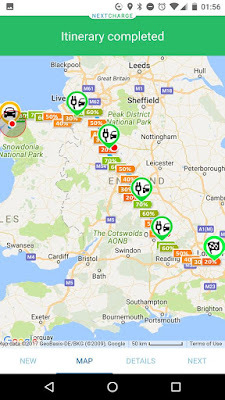 I had calculated that these local journeys added up to account for many more miles average over the year than one or two longer trips away in the van e.g. to the alps. Initially my plan was to keep my van for longer trips. However, it soon became apparent that our electric car was capable of much more than just a local run-around. Roll on 8 months and 12,000 electric miles later we have we have now ditched both my diesel van and our diesel car in favour of a single fully-electric 2014 24kWh Nissan LEAF. 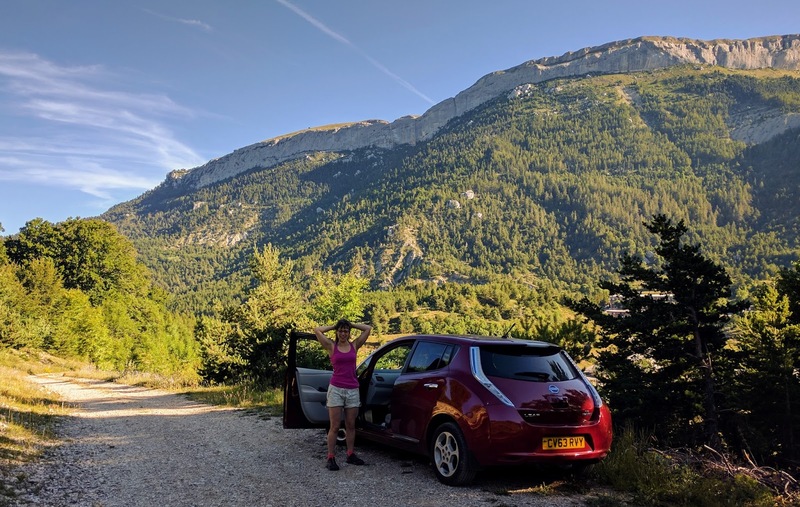 After experiencing driving an EV it felt like a step backwards to take my van for a long trip. It was difficult to justify the vastly increased carbon and particulate emissions, noisy, less comfortable driving and massively more expensive option of driving my van. 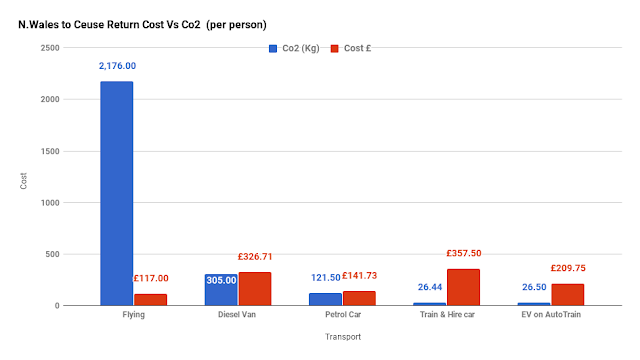 See my previous blog post "Zero Carbon Future, Low Carbon Present" comparing the emissions and running cost of EV Vs petrol / diesel cars. 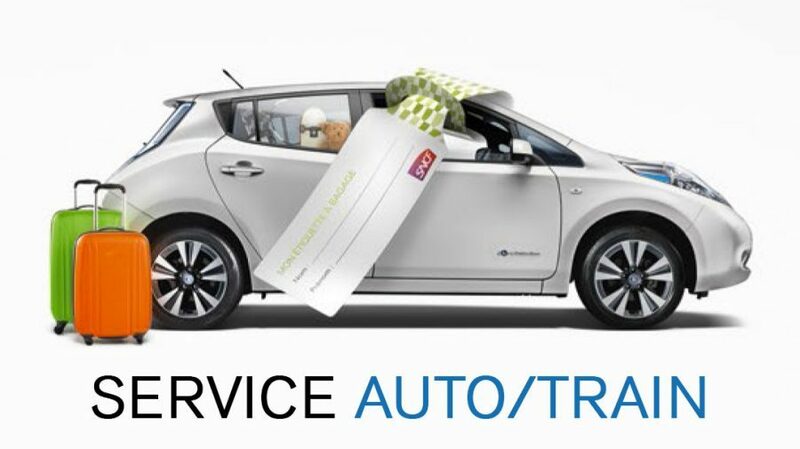 We are lucky in the UK that we have a fantastic motorway Rapid Charge network than are able to charge our Nissan LEAF in 20-30min, driving anywhere in the UK is not a problem as long as the increased journey time is taking into account. In my opinion it's a small price to pay for vastly cheaper driving (2p/mile) and much lower carbon emissions. In the last 8 months we've driven the EV to Scotland, Peak District, Yorkshire, Lake District and London without any issues. 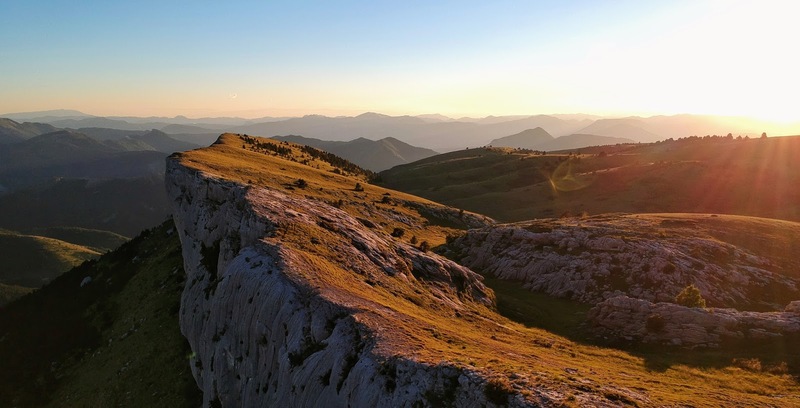 Trips abroad e.g to the alps typically require long distance driving without many stops. This type of 'mission' driving is not particularly suited to EV's, or humans for that matter (#bladderanxiety)! Luckily there is a viable option to get to the Alps / South of France in an EV: SNCF run an AutoTrain service from Paris to many destinations in the South of France. 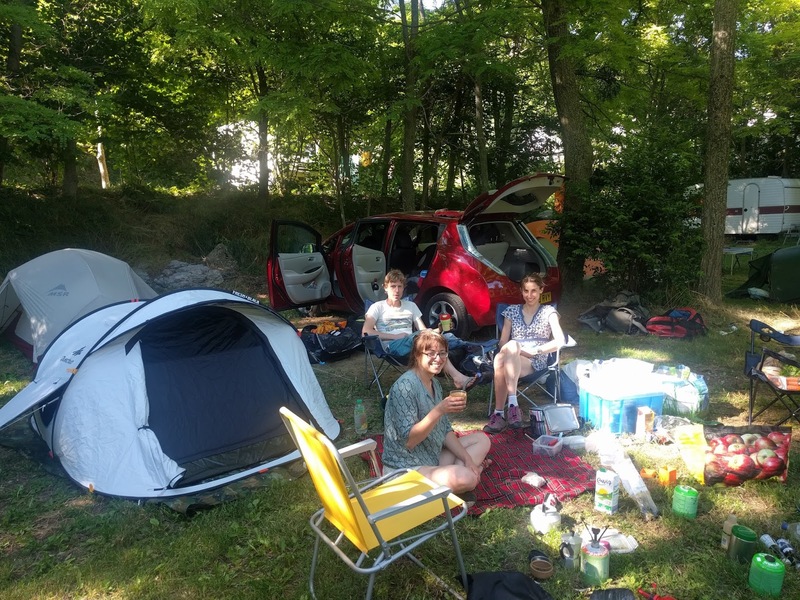 Looking at the transport options for a climbing trip to Céüse (which has become an annual event! 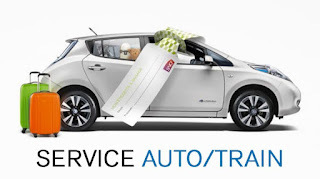 ), taking the EV + AutoTrain actually worked out more cost effective than taking a train and hiring a car and only slightly more expensive but much lower carbon than driving all the way in a petrol car. Unfortunately it's not possible to actually travel in the vehicle while it's on the AutoTrain. The vehicles travel overnight on an open sided freight train and passengers need to book onto a separate train. We opted for a night train which was very time efficient. 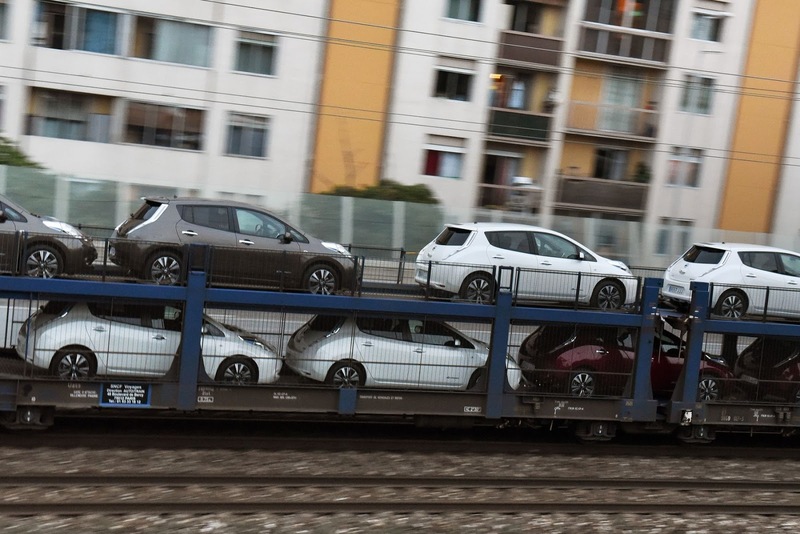 We paid a £179 each-way to transport the EV on the AutoTrain from Paris to Marseilles and £31.50 each-way (per person) to travel overnight on a sleeper train...cheaper than a hostel! Although maybe not yet as good as in the UK, France has a reasonable EV Rapid Charge network. 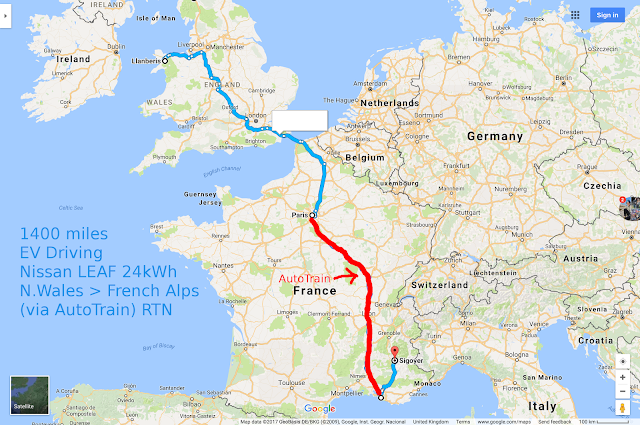 Given the time and a (high boredom threshold) it would be possible to drive an EV all the way to the South of France..for free (if you choose the use supermarket rapid chargers)! The best website (French PlugShare / Zap Map equivalent) for scoping out charging options in France is ChargeMap.com. The comments section on each charging point is highly informative and regularly updated by French EV drivers. The Android app for ChargeMap works very well. Homework complete, all the charging passes, cables and Céüse climbing guidebook obtained! All French rapid chargers have the standard Chademo, type-2 and CSS connectors therefore work exactly the same as in the UK. There are also lots of 'free' rapid charging options at Auchan supermarkets, town centres, Ikea stores and Nissan dealerships. These charges are activated using a kiwhipass RFID card which is currently a little tricky to obtain in the UK, follow these instructions. 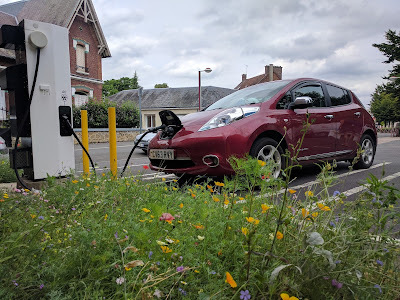 Many French public 'fast' chargers use a type-3 socket, although apparently slowly being phased out in favour of the standard type-2 which is used on most UK public EV charging stations. A type-3 to type-1 cable is required to charge a Nissan LEAF from a type-3 public socket. I borrowed such a cable but did not use it since we only used rapid chargers while on the move, then charged via a standard campsite hookup at our destination campsite. 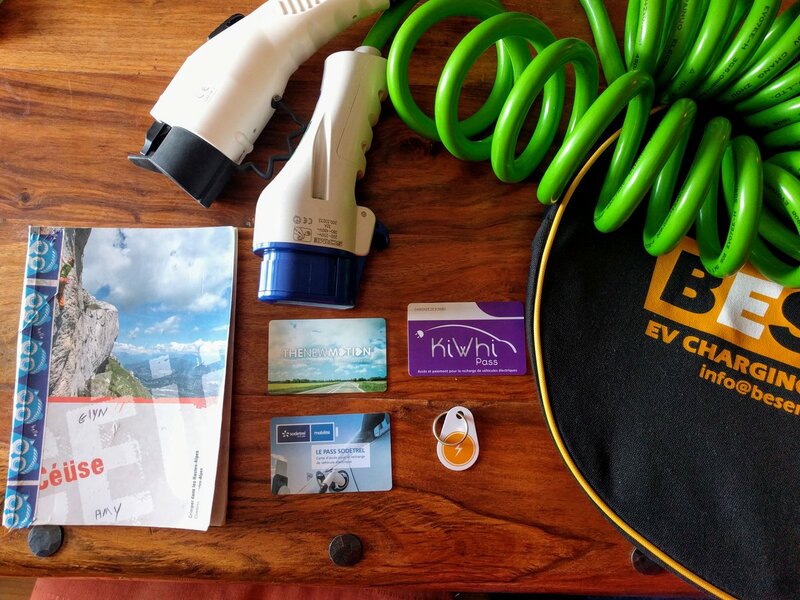 Charging an EV from a campsite hookup is usually no problem. Most campsites use 16A blue hookups. A 16A hookup to 13A 3-pin adaptor then use a 10A EVSE 'granny-cable' is the easiest way to do it. 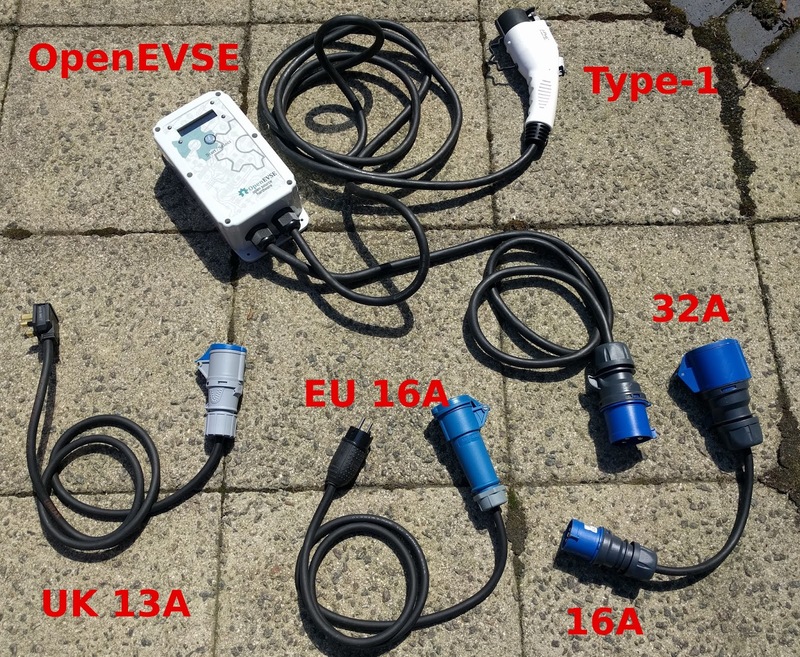 However, I use my OpenEVSE setup to be able to change at the full 16A and if needed set the current lower e.g. 6A. This is useful if many users are using the hookup and the campsite has got dubious wiring and long cable runs. Having said that I've not had an issue charging at 16A from campsite hookups. However, if speed is not essential I would choose to charge at 8/10A to put less strain on the hookup. Apparently some campsites in France have a 6A restriction, I have not come across this myself. See my DIY OpenEVSE below. A two pin (plus ground) 'Schuko' plug is used on the continent. These sockets can actually handle up to 16A as opposed to 13A from UK sockets. It's not a good idea to try and charge an EV via a travel-plug adaptor. Travel adaptors are not generally rated for high currents and often don't have an earth connector that is required by EV chargers. My DIY OpenEVSE portable variable charge rate setup (6-32A) in 1A increments. Here is an account of our journey, its rather un-interesting reading but might be useful for someone making a similar trip. 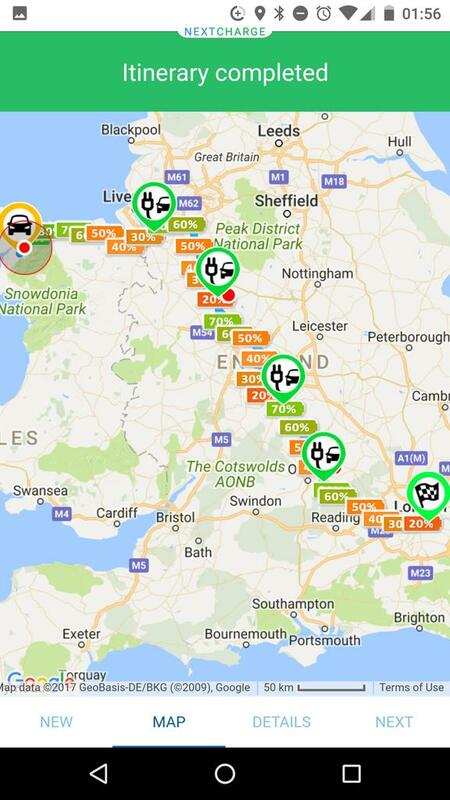 Casual drive, easily done using Electric Highway Ecotricity network. Possible in 4 rapid charge stops, although I did 5 since London traffic meant I took the long way round the M25. 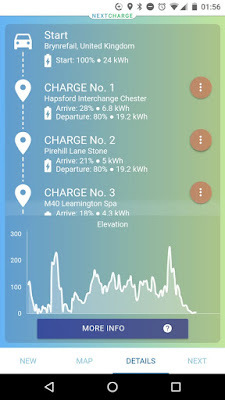 NextCharge app ise useful for planning EV journeys, even takes elevation into account! Early start from London, charged overnight from 3-pin plug at friends house. Free 20min topup at EuroStar Le Shuttle terminal. Located just outside the main entrance. Only 1/2 units was working but one was all we needed! Bit tricky to find on the top story of supermarket car park. PlugShre location has been updated. Luckily a Golf GTE had just finished charging. Free charge. Approx 20min stop. Bought some lunch supplies from the supermarket...mmm cheese. Beautiful little French village with 2x rapid chargers! Renault Zoe EV charging next to us. Nice bakery and Carrefour market closeby. Busy little service station near the airport. ICE blocking the charger, managed to get the owner to move. 26min to get 9100kwh costing 3.50 EUR. Water tap and 3-pin socket (laptop topup!) close by. Made it to the AutoTrain station (Paris Bercy) with minutes to spare. Free rapid charger if we needed it, however I was happy to let the car travel overnight at 40%ish to let the battery cool down. 11 rapid chargers over two days the battery was 57 degC, one bar away from red. Unlike Teslas Nissan LEAFs don't have active battery thermal management which is a bit of an omission in my opinion, however it's not usually an issue unless doing many many rapid chargers in a row in high ambient temperature. It was over 30 deg C outside. Maybe I was being overly worried, however I am aware that high elevated temperatures does cause lithium batteries to degrade faster. If the battery was to get into the red zone 70 ish degC? Motor power and charging rate would temporarily be limited (I've head reports of 50 MPH max and slow acceleration). I was keen to avoid this. 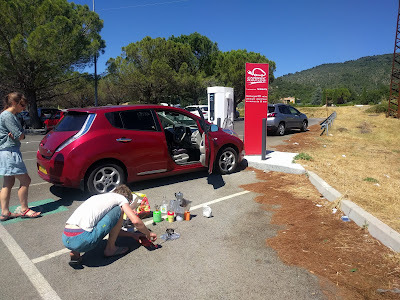 Since we started this leg on 40% we topped up at a free rapid charger at a Nissan dealer in Aix en Provence. Battery had cooled to ambient temperature overnight. Another free supermarket charger that works even when supermarket is closed, we found out on the return journey! Yet another free supermarket charger. On arrival I unplugged Citroen C-zero which had finished charging (I thought), only to find out that the driver had actually not pressed start. He was not impressed since he thought I had unplugged his car before it had finished! Did a big supermarket shop and had lunch. Very hot, 35 degC ish. Thanks Lidl! Very impressed with the store, we did a bulk shop before heading to the campsite. 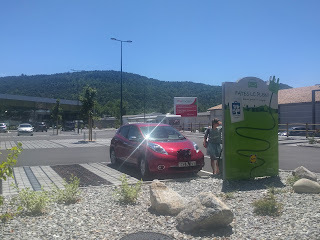 Then final leg to campinglesguerins where we had a 16A electric hook up that we used to charge using OpeneEVSE (see above) when we needed to drive which wasn't very much. But the hookup was useful to charge phones / laptop / done and it allowed us to leave on 100% charge. Hookup cost 3 EUR / night, owner didn't seem to mind us charging the car. I tried to charge the car at off-peak times at a low charging current 8-10A, however on the last day I did charge at the full 16A and there was no problem.